Curious about building a website for yourself? It is completely achievable and can be done very cheaply. I’ll give you a very basic walk through of how this one is built. Starting out – here are most of the tools used in building this website. Website is hosted on RedHat OpenShift and uses the WordPress cartridge. Domain name was registered through NameCheap * – Whois Guard protection and SSL certificates were also purchased through them. Akismet, Jetpack, Wordfence, MonsterInsight Analytics, and AWS plugins were also used for the site. My opinionated content is typed through the raw power of hitting keys on a keyboard. Images were made with GIMP, Wings 3D, or a phone camera. Unfortunately OpenShift has changed to a new architecture so this guide is out-of-date. Not all is lost though! You can create a free website for a year with Amazon Web Services (AWS)- you’ll just need to buy a custom domain name. Check out the Bitnami WordPress Image to get started somewhat easily. 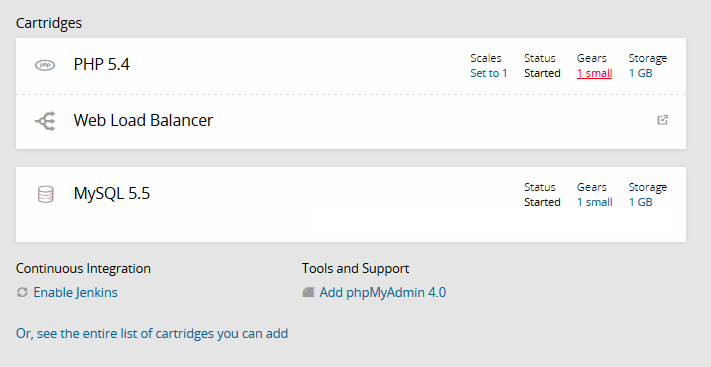 Alternatively, check out this AWS guide to setting up a WordPress site. If you happen to already have access to an OpenShift V2 account or are just curious, you can keep reading. I’m not going to walk you through every single tool, but below is a full guide for the first two steps and a more complete picture of how the site is made at a cost of about $1.45/month! This guide will show how to build a website like mine, but won’t actually use the same info as my site! There are other options out there for hosting, but I personally used OpenShift and NameCheap. You’ll also have to make the content yourself, and that may be the most important thing! 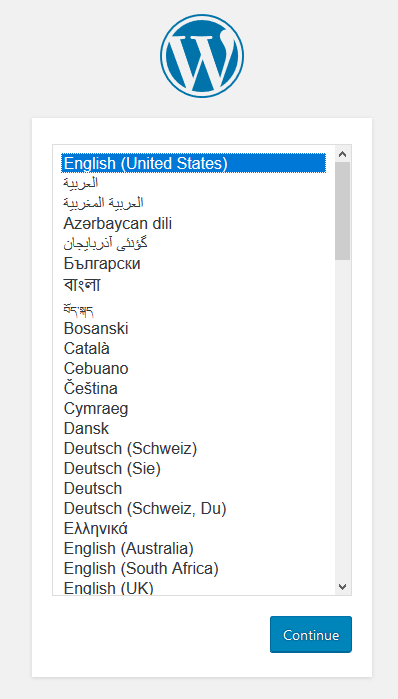 You can then configure the site! Here are example options with a different domain name. You’ll get three small gears for free, and this setup will use two of them unless you start getting more traffic. When you start getting more traffic, OpenShift will automatically start adding more gears to your application. Boom it was created! Check out the application! 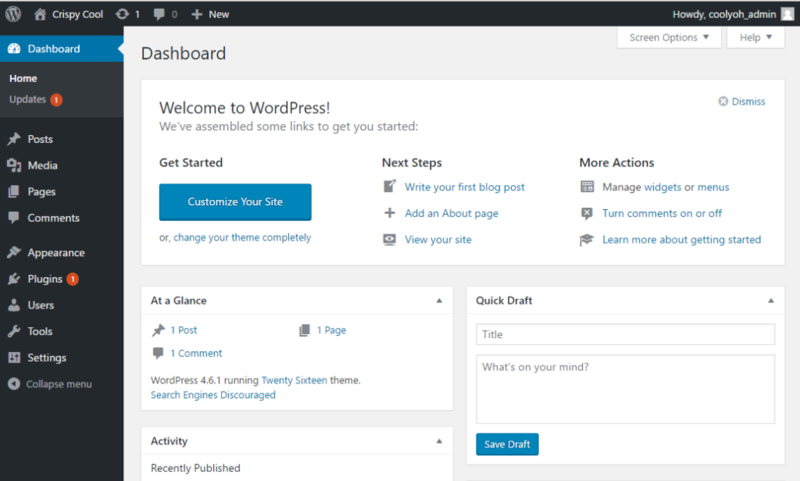 You’ll now want to configure your WordPress site. Visit the site url that you created – in this case it was http://test-domain.rhcloud.com. And then actually configure the login. Again – these are different names than my actual site and you’ll want to customize the fields for yourself. Don’t use “admin” as the username! Sweet now WordPress should be installed and you can access your WordPress dashboard by logging in with the info from the form you just filled out above! When you log in, it should bring you to your dashboard, which will look like this. I’m not going to walk you through all of the WordPress configurations, but you can start creating content from this dashboard and customize your site. At this point you have a fully functioning site. 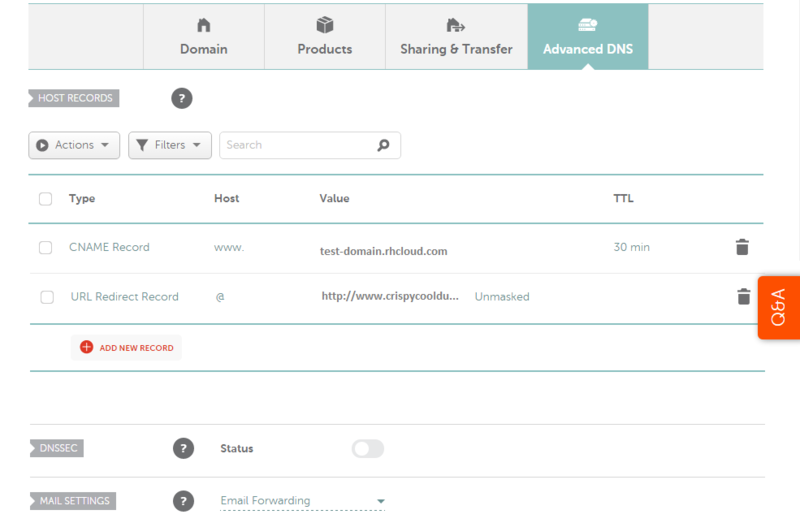 If you’re okay with a name like test-domain.rhcloud.com, then you’ve got a completely free site ready for your personal touch. Starting out, you’re going to have to pick a domain name. I suggest giving it a good amount of though because once you buy it, you’ll have to pay again to change it! As you come up with some ideas, test them out to see if they are available! For this example, I’m going to use the domain name “crispycooldude.com”. Now it is time to add the options for your site. You can change and pay for these options later too. I started out with two years, you can start out with just one year to get off even more cheap. I added WhoisGuard for my privacy and then also added PositiveSSL for your privacy. If you plan to use SSL (https protocol), set up will be more complicated and won’t be covered in this guide. I use SSL because I like security – you may not necessary need SSL. After you purchase the domain name, you’ll have to create an account. Once you finish the account creation, you’ll want to log in so you can start setting the domain up. 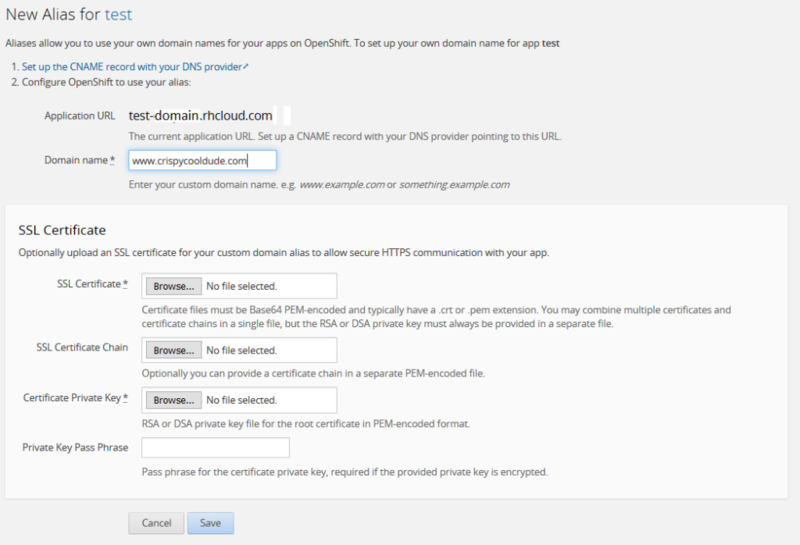 The domain and OpenShift site won’t just automatically link themselves! 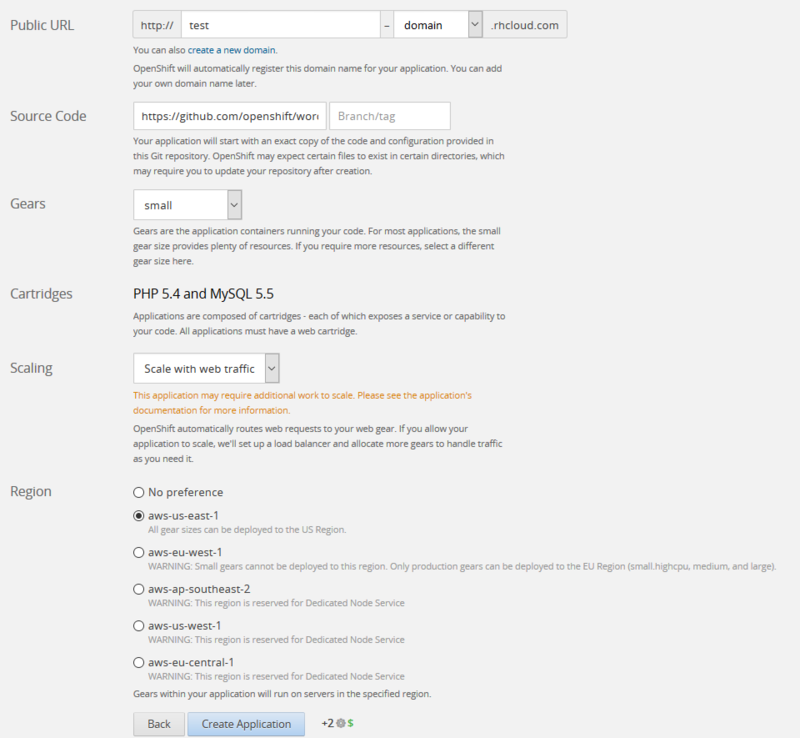 When you log into NameCheap, your dashboard will have an area similar to the image above. You’ll want to click on the “Manage” button. From there, you’ll get to the screen below. I added a URL redirect here so the www version will be used. Note that the redirect for https isn’t set up yet – if you have a SSL certificate, you can change that later. After setting up a redirect, click on the Advanced DNS tab. That’s all you need to do with NameCheap as far as basic configuration goes! Next it is back to RedHat OpenShift to finish up the use of a custom domain! You’ll want to navigate to the site you set up on Openshift and click on the application, which will bring up something like the window below. From there, you’ll want to click on the “change” link next to the name. Once you get to the page below, it is time to set up some aliases to make your custom domain name work. For this example, I’ll set up the aliases “www.crispycooldude.com” and “crispycooldude.com” – saving each one as I create them. Once all of that is saved, you can visit your site with the custom domain name! However, before you do that, there is one more change you should make if you’re using WordPress. You’ll want to navigate back to the application and click the gear link shown below. From there, you should change the gears on the PHP cartridge to a minimum of 1 and maximum of 1. This is important because WordPress does not scale nicely as-is. If you try scaling it, images and plugins will go missing if you don’t manage things correctly. That all said, unless you’re going to be getting a good bit of traffic, or like messing around with things for fun – you’ll want to leave the scaling to just one gear. Congratulations! You made your way through creating your own website with a custom domain name! The content is now up to you! One clear benefit about using this setup is that you can scale it for traffic – it does get complicated though. From testing I’ve completed, the two free small gears that OpenShift provides can handle around 20 requests per second with this setup. This isn’t enough for a large site with a lot of visitors, but the great thing is that you can scale the site if you start getting more visitors – up to 16 gears. You’ll have to start paying more as the application scales, but you will have a lot of traffic if your application has to scale! *Note that this is an affiliate link. I will receive compensation if you make a purchase through the link. That said, I do use and recommend NameCheap.